A Seal Beach elementary school principal is under scrutiny today over a Facebook post condemning Nike for its decision to run an ad campaign focusing on dissenting quarterback Colin Kaepernick. 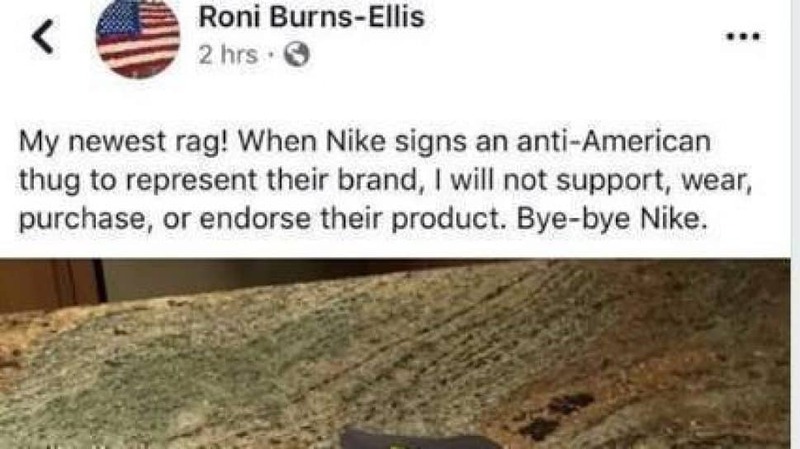 McGaugh Elementary School principal Roni Burns-Ellis posted a photo of a Nike T-shirt cut into pieces on her personal Facebook page and wrote, “My newest rag! When Nike signs an anti-American thug to represent their brand, I will not support, wear, purchase or endorse their product,” the Orange County Register reported. The petition included a screenshot of the post, which has since been removed from Facebook. A screenshot of the principal’s Facebook post. Courtesy the Chang.org petition. Kaepernick has come under fire, most famously, in tweets by President Donald Trump, for taking a knee during the national anthem at football games to protest police brutality against African Americans. Los Alamitos Unified School District Superintendent Sherry Kropp told the Register that Burns-Ellis’s stance does not reflect the district’s. “One person’s personal opinion on a personal Facebook page does not represent the values of our district,” she said.